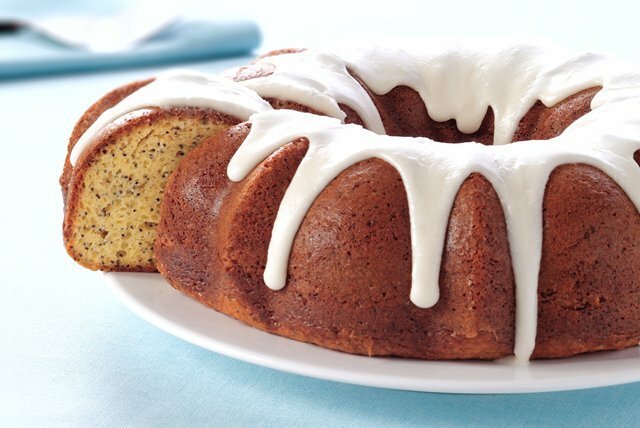 Wow the crowd at your potluck with this Poppy Seed Cake Recipe! This Poppy Seed Cake Recipe is beautiful, delicious and makes a great post-brunch treat. Beat first 7 ingredients with mixer until blended. Pour into greased and floured 12-cup fluted tube pan or 10-inch tube pan. Bake 50 min. or until toothpick inserted near center comes out clean. Cool cake in pan 10 min. Loosen cake from sides of pan with knife. Invert cake onto wire rack; gently remove pan. Cool cake completely. Mix remaining ingredients until blended; drizzle over cake. Prepare as directed with 1 pkg. (1 oz.) JELL-O Vanilla Flavor Sugar Free Fat Free Instant Pudding, BREAKSTONE'S Reduced Fat or KNUDSEN Light Sour Cream, and MIRACLE WHIP Light Dressing. Substitute orange juice for the sherry.